According to Red Hills Rods and Choppers, the majority of Pontiac GTO Ram Air IV cars currently on the road don’t have their original engine and transmission. As a result, a numbers-matching model will generate significant interest among Pontiac enthusiasts, and the 1970 Pepper Green example Red Hills currently has for sale is no exception. 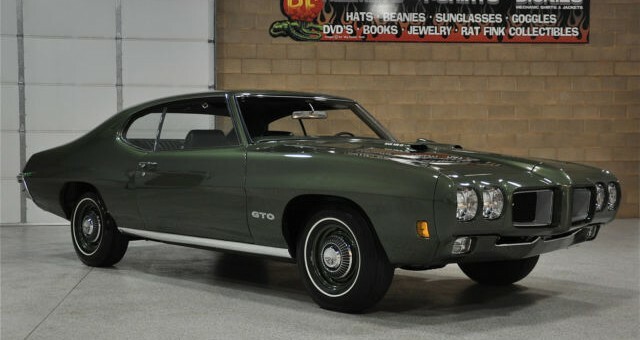 The fourth iteration of Pontiac’s Ram Air option for the GTO added high-flow exhaust manifolds and cylinder heads, a high-rise aluminum intake manifold, a larger Rochester QuadraJet four-barrel carburetor, a high-lift camshaft and more to the GTO’s standard 400 cubic inch V8 engine. Pontiac claimed the Ram Air IV engine produced 370 horsepower, 20 more than the non Ram Air-equipped 400 V8. This Ram Air IV GTO has numbers-matching, all original parts from front to back. The engine is the original that was installed in the car in the factory, as is the Muncie 4-speed manual transmission and the 3.90 Safe-T-Track rear axle. Red Hills says no corners were cut in its concours-quality restoration, with all parts, even the whitewall Firestone tires, being factory correct. Many well-respected classic car clubs, including the GTO Association of America, have recognized the quality of this rare Ram Air IV. The GTOAA handed it down its coveted Concours Gold Award, while the Pontiac-Oakland Club gave it their Senior Gold Award for its quality. A numbers matching Ram Air IV GTO is the Holy Grail for some vintage Pontiac fans, and this example is commanding an asking price that reflects its desirability. Check out the listing here for additional information and photos. This car should inspire three next Camaro. In fact, GM should do a varient (front facada, rear facada, altered C pillar), like in the old days, and name it the Chevrolet Pontiac GTO. Such a car would be a hit with collectors, Boomers, and long term fans. Sounds like a Frankenstein car (or, dare I say, a Homer) to me. GTO is a car Classic, I really like this car very much. , Dreams, I want to 1964 Pontiac GTO 1 cars.